Peeling DIY | Say goodbye to dry skin! You’ve had enough of the whole dry and chapped skin situation? Good, same here! We are getting rid of all the winter dryness with this quick and easy peeling DIY. 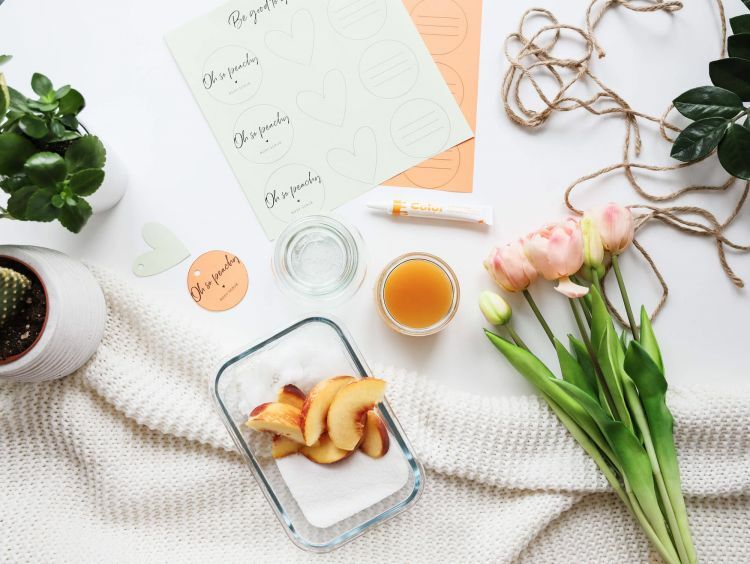 With only a few ingredients, you can create a lip scrub and body peeling that’ll get your skin ready for spring! There are endless ways to make your own peeling. But the base is always pretty much the same: We need something grainy - like sugar or salt - and something moisturising like coconut oil or any other edible oil. Face peeling, hand scrub, body peeling, lip scrub. Many different names but they all consist more or less of our main two ingredients that we are going to spice up with a fresh and fruity scent in our DIY! White cane sugar - don’t use very fine sugar - it’ll melt! Ribbon and label for the jar - download our free labels here for free!! Optional food coloring - we didn’t end up using any because we already liked the natural peach color. as many teaspoons of peach nectar or puree as it takes to get a grainy yet smooth mixture. First off, mix the cane sugar and coconut oil. Make sure the oil isn’t hot or too warm because that’ll cause the sugar to melt. Don’t overmix! Add a few teaspoons of peach nectar or puree to the base peeling mixture. We’ve used about 6 teaspoons for our small jar. 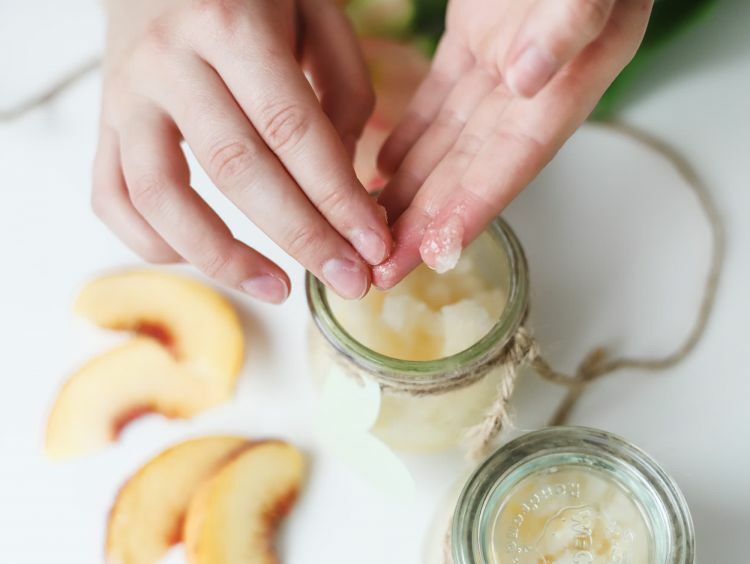 Mix well and fill it into your jar - and you’re already done with your homemade peeling for your hands, body and lips! 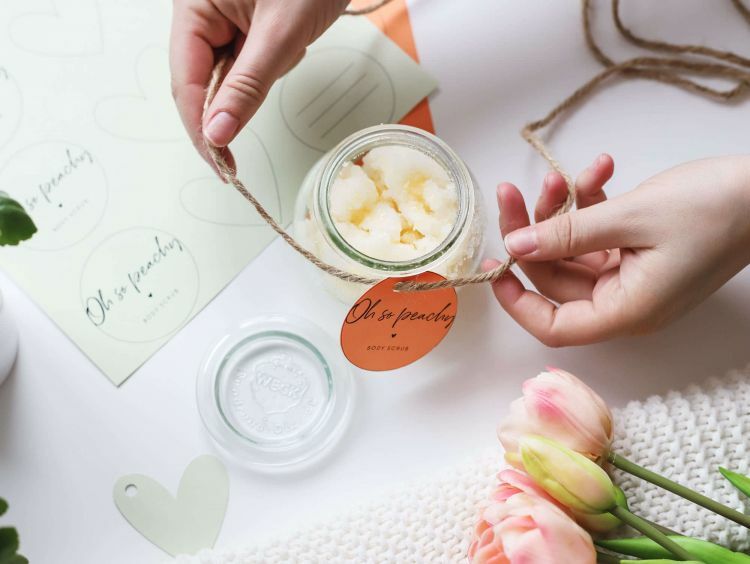 Download the free peeling labels here and put them on your jars. Note the date and keep the peeling in the fridge and use it up within a week. Your peachy skin is just a few scrubs away! Sensitive skin, dry patches or chapped lips - the peeling will take care of all of it! Get rid of dry and shed skin on your face, hands and lips by applying the peeling with pressure in circular movements. The grainy sugar will stimulate the blood flow and get rid of the dead skin. 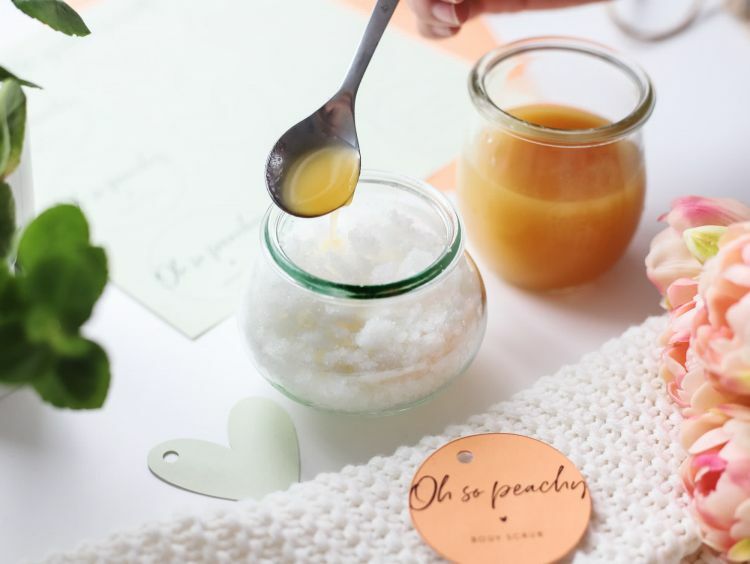 The coconut oil moisturises your skin while the peach nectar makes it smell and taste extra fresh! After applying the peeling thoroughly, wash it off with lukewarm water and apply some lip or hand balm afterwards. 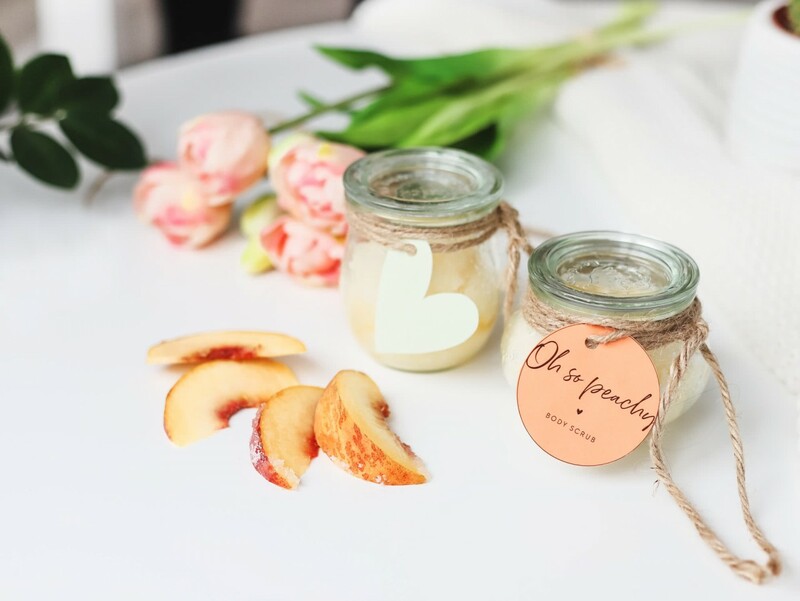 We hope you’ll love this super easy and peachy DIY peeling just as much as we do!